Open channel flowmeter for discharge measurement in rivers and open channels. 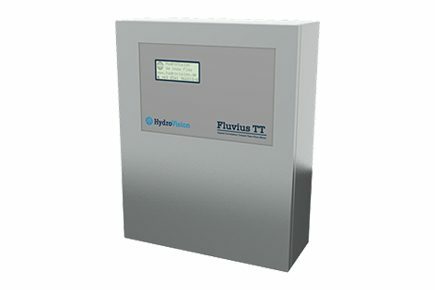 The range of application for Fluvius TT transit-time ultrasonic flowmeter runs from small waterways to huge river systems with high suspended solids. By means of acoustic transmission a coded signal is sent through the water and the transit time and flow rate is calculated providing the speed of river flow. When an acoustic wave propagates in water, part of the energy is damped by friction and suspended solids. This procedure is frequency related. The higher the frequency, the bigger the damping. For wider distances we use low frequencies as they allow for a considerably better receiver signal.